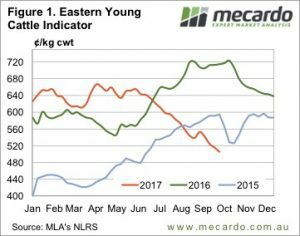 It was only in mid-July that the Eastern Young Cattle Indicator (EYCI) broke through 600¢. The downward spiral now has the EYCI looking down the barrel of a number with a four in the front. There has finally been some positive news on the climatic front, however, which could and should provide some support, if it eventuates. It has only taken ten weeks for the EYCI to lose 100¢. Figure 1 shows what looks like an inevitable slide towards the 400s, with the EYCI this week sitting precariously at 505.5¢/kg cwt. 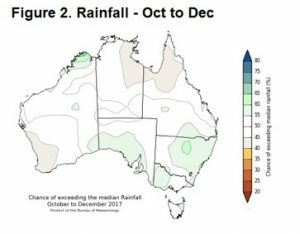 The slippery slope has been lubricated by relentless dry weather through most of NSW and Southern Queensland, but the Bureau of Meteorology (BOM) suggests this might be about to change. Figure 2 shows that the BOM are putting a 50-60% chance of much of the east coast receiving better than median rainfall from October to December. For October the chances of exceeding median rainfall is even better. There is a better than 55% chance of much of the east coast higher rainfall zones receiving 50mm or more. It was feeder steers which managed to defy the trend this week, gaining 8 and 7¢ in NSW and Victoria respectively, to move back to 286 and 283¢/kg lwt. 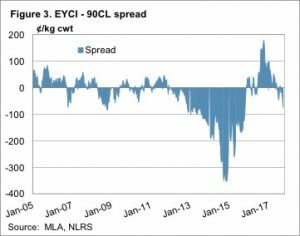 It was trade steers that drove the EYCI lower. More positive news was a solid rally in the 90CL Frozen Cow price, it gained 14¢ to hit a two month high of 580¢/kg swt. Figure 3 shows the EYCI now at a 3 year low in terms of its discount to the 90CL, which used to be about as low as it would go. From 2013-2015 that changed obviously. There is hope of cattle prices finding some support, given that the discount to beef export values is starting to get extreme. If the BOM’s forecast comes to fruition you could almost guarantee a 10-20% bounce in cattle prices. But we have to see the actual rain first. A betting grower would be buying cattle and putting it all on October rain, as it will provide a good payoff.